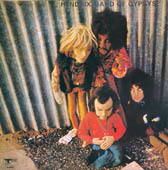 Band of Gypsys was also released in some countries in an alternative “Puppet” sleeve (the initial 1970 UK Track 2406002 or Australian Polydor 2406002 on vinyl and also the original Japanese vinyl and CD releases). This cover was a really sub-par Graphreaks effort and displayed no photos of the band (Graphreaks were also the designers of the really innovative The Who’s “Live At Leeds” cover originally released on Track Records 2406001 in the UK). The puppets are - clockwise from left - Brian Jones, Jimi Hendrix, Bob Dylan and John Peel. What 3 of the 4 had to do with Band of Gypsys is anyone’s guess. 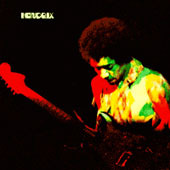 The cover preparation was the result of another executive decision at Track Records by Kit Lambert and Chris Stamp to change the original artwork for the UK release (for more of the same, see Electric Ladyland’s UK “electric lady” cover – hated by Jimi apparently - or the proposed artwork for Who’s Next). Later U.K. vinyl pressings and the CDs were based on blurry, non-gatefold reproductions of the original U.S. Capitol cover. Why someone of the reputation and sales record of Jimi Hendrix should have been treated so shoddily is simply beyond belief. I guess it has something to do with the legal ramifications of the ongoing PPX/Capitol vs Jimi Hendrix and Polydor court case. The sound quality of the UK vinyl was never as good as that of the US, being cut at a sub-optimal volume and with rolled off bass and treble frequencies. This causes a poor signal to noise ratio in an already hissy recording. The Australian vinyl was cut at a standard level, even if it also had a little bass and treble roll off and used the same sub-par puppet cover. The audience laughing after his crack at the beginning of Machine Gun (“.....if we can get over this summer....nya ha ha”) was most audible on this release. The EH/Capitol version includes all the original cover art, as well as a detailed essay on the history of the recording and the legal hassles surrounding its release, whereas the 25th Anniversary Edition simply replicated the original US vinyl cover in either a thin paper booklet or a mini vinyl cardboard replica. The prior Polydor releases, on both vinyl and CD, were both poorly reproduced and deleted the inside spread of the U.S. gatefold, as well as sounding substandard. For sound quality, in order of preference, The Classic records vinyl reissue may be the best version (I haven’t heard this), followed closely by either the EH/Capitol or the nearly identical sounding EH/Sony CD versions and then the Capitol 25th Anniversary CD and vinyl versions. The Australian vinyl version comes next and finally the UK Track/Polydor versions of this album are inferior (both on vinyl and CD) – unusual for Jimi Hendrix albums, where the Track/Polydor copies were usually much sought after for sound quality (e.g. Are You Experienced, Axis: Bold as Love and Electric Ladyland). The only caveat I found with original Capitol US vinyl was that it was always noisy (apart from the tape based noises mentioned above) in at least 3 copies I tried (possibly a legacy of the poor quality vinyl being used at that time). Otherwise, it could rank above the Capitol 25th, if you can find a mint green label and Robert Ludwig mastered pressing. Avoid the non-gatefold reissue from the 80s. Microsoft co-founder Paul Allen owns the multitrack tapes of the Band Of Gypsys performances at the Fillmore. It appears that he has allowed Experience Hendrix access to them for a 5.1 remix of the sound to match the only video of the performance on the 2011 version of the “Band Of Gypsys” DVD.